43 Commercial Real Estate & Properties in Mooloolaba are listed in 6 categories. We have 23 OfficesSale & Lease , 15 Retail ShopsSale & Lease , 2 Hotels and LeisureSale & Lease , 1 Medical and Consulting PropertiesSale & Lease , 1 Development LandsSale & Lease and 1 Other Commercial PropertiesSale & Lease . Why base yourself in the CBD when you can be in Mooloolaba, right upstairs from quality retail, restaurants and cafes and across the road from the beach. This high quality office is the only space in Mooloolaba where you have the option to negotiate up to 10 undercover car parking spaces with the tenancy. The high quality fit out makes this space ready to move straight in. + Three car parking spaces included, up to ten available by negotiation + The rental price has been reduced, now available for $330 per square metre + outgoings + GST + 123sq m (approx) air conditioned premium first floor office + Near new quality fit out with extremely high level of finish + Floor to ceiling windows overlooking First Avenue + Elevator access + Modern high quality building with excellent amenity to Mooloolaba dining and entertainment precinct + 122sq m (approx) adjacent tenancy also available for lease Call or email Louisa Blennerhassett to inspect the property or find out about other suitable options. Our team is strategically located in two offices across the Sunshine Coast region and is ready to handle your commercial, industrial and retail property needs today so call or email now. 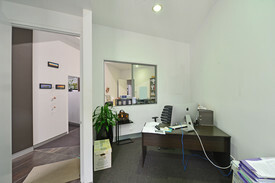 Fitted Out Professional Offices In Good Location Mooloolaba $1,788.50 pcm including G..
55 m2 Kitchenette onsite amenities Ample onsite car parking Rear access Excellent signage opportunities Huge exposure to drive by and walk by traffic 55m2 is available for lease in the next few weeks, within the Bundilla Fair on Brisbane Road. The premise boasts excellent exposure to Brisbane Road, offering great signage opportunities visible to ample drive by and walk by traffic. The Bundilla Fair shopping complex is home to a number of well established local and national tenants including dentist, seafood market, cafe's, hairdresser etc. It is prominently positioned as the main link road between the Sunshine Motorway, Nicklin Way and Mooloolaba Esplanade. For further information or to arrange an inspection please contact exclusive marketing agent Emily Pendleton. Commercial Office - Location Second To Non $142,800pa + outgoings + ..
Top floor office with wrap around balcony and beautiful views including a quality fit out ready to walk in and operate in one of the best buildings on the Sunshine Coast. + 169sq m (approx) office suite in the La Balsa complex + Exclusive on site parking for staff + Elevator access and high class amenities including roof top dining area + Walking distance to Mooloolaba Esplanade, cafes, bars and beaches + Low outgoings + This location boasts multiple restaurants and coffee shops within walking distance to meet and greet clients Call or email Matt Marenko or Louisa Blennerhassett to inspect the property or find out about other suitable options. Our team is strategically located in two offices across the Sunshine Coast region and is ready to handle your commercial, industrial and retail property needs today so call or email now. Professional Office/consulting Suite For Lease | Brisbane Road, Mooloolaba $19,315.80 Gross Includin..
84m2 Well fitted out with individual offices, boardroom, reception, kitchen/lunch room and additional filing/storage area Fully air conditioned Located on first floor, currently occupied by Thompson Building Group who are condensing their space Ample natural light coming through entire office Positioned perfectly on Brisbane Road, minutes walking distance to the beach Excellent signage opportunities with exposure to main road (Brisbane Road) Available immediately if required Contact our marketing agent Emily Pendleton on 0402 435 446 for further information or to arrange an inspection. 103m2 Beautiful large shared balcony overlooking the water Two exclusive car parks + ample street parking Well fitted out with four offices, boardroom, reception, kitchen/lunch room and additional filing/storage area + shared balcony Located on first floor, accessible either via stairs or lift Ample natural light coming through entire office Positioned perfectly in the heart of Mooloolaba just footsteps to the beach Previous tenants have left fit out including filing cabinets, desks, computers, phones chairs which can be used at no cost to the next tenant, or it can be removed Toilet facilities located on the floor Contact exclusively appointment marketing agent Emily Pendleton on 0402 435 446 for further information or to arrange an inspection. Two tenancies located on the First Floor One tenancy located on the Ground Floor Options to lease spaces as a whole or separately Exposure to Brisbane Road Excellent signage opportunities Outgoings are very reasonable (no strata levies) Exclusive on site car parking Ample street car parking Unit 1 (Ground Floor 105m2) $31,500 P/A Net Unit 3 (First Floor 78m2) $21,840 P/A Net Unit 4 (First Floor 56m2) $15,960 P/A Net Approx. 239m2 of office space is available on Brisbane Road to be leased together or seperately. There are 4 exclusive use car parks and ample on street parking. There is some fit out at the moment with toilet and kitchenette facilities for both tenancies. Contact exclusively appointment marketing agents for further information or to arrange your inspection today! Ray White Commercial Northern Corridor Group are pleased to present 19/13 Mooloolaba Esplanade, Mooloolaba. 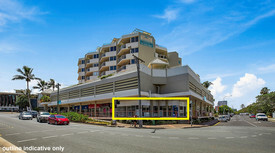 High foot traffic location on Mooloolaba Esplanade Great exposure and visibility at this busy waterfront location 44m2 retail space with change rooms to the rear Mooloolaba Esplanade is a popular destination with a wide variety of retail shops, cafes and restaurants. This property has great visibility with green space to the front, and ample street parking. This attractive retail space is available now, so take advantage of the summer trading and enquire today. Is Your Business Worth It - Penthouse Office With Sweeping Views And Massive Incentives $230,000pa + outgoings + ..
Freshly refurbished and awaiting a new tenant, this prime office space is located above the bustling retail strip that is Mooloolaba Esplanade with an endless view over Mooloolaba's main beach. This location is second to none with some of the Sunshine Coast's best restaurants and coffee shops below to meet and greet clients and customers. The building has undergone a major upgrade ready for you to move and very attractive incentives are available now. + 200sq m to 408sq m (approx) partially fitted out office space + Excellent natural light throughout + Direct elevator access to main foyer and basement car parking + Expansive views of Mooloolaba's main beach + Freshly carpeted and repainted + Dedicated on site parking + Attractive incentives available Please contact the exclusively appointed marketing agents to secure an inspection today. High Foot Traffic Location Great Exposure Location Visibility to the Esplanade, Located within the Mantra Resort Arcade High Foot Traffic Location Ample Onsite Basement Carparking 86m2 Retail Tenancy The Option to Keep the Fit Out or Remove Positioned in the well established and popular Mooloolaba holiday hot spot of Mooloolaba Esplanade the opportunity has presented to lease 86m2 retail space. Make the best use of the high exposure location which would suit a variety of businesses. The space is only complimented with an abundance of foot tragic, and easy access for clientele with onsite basement parking. Contact our marketing agents today to discuss further or to arrange an inspection. 188sq m (approx) prime site fourth floor commercial office space in the La Balsa commercial building, ideally located in the heart of Mooloolaba. This location boats multiple restaurants and coffee shops within walking distance to meet and greet clients. + 188sq m (approx) A Grade fourth floor office space + Internal kitchenette + High quality existing fit out + Exclusive on site parking for staff + Elevator access and high class amenities + Walking distance to Mooloolaba Esplanade, cafe's, bars and beaches + Low outgoings + Available immediately Call or email Kenny Knight to inspect the property or find out about other suitable options. Our team is strategically located in two offices across the Sunshine Coast region and is ready to handle your commercial, industrial and retail property needs today so call or email now. 52sq m (approx) prime site first floor commercial office space in the La Balsa commercial building, ideally located in the heart of Mooloolaba. This location boats multiple restaurants and coffee shops within walking distance to meet and greet clients. + 52sq m (approx) A Grade first floor office space + High quality existing fit out + Exclusive on site parking for staff + Elevator access and high class amenities + Walking distance to Mooloolaba Esplanade, cafe's, bars and beaches + Low outgoings + Available immediately Call or email Kenny Knight to inspect the property or find out about other suitable options. Our team is strategically located in two offices across the Sunshine Coast region and is ready to handle your commercial, industrial and retail property needs today so call or email now. Flexible Office Suites In Premier Location From $66,000pa + outgoing.. This restaurant has a prime position on Mooloolaba Esplanade. Includes liquor licence and full fit out if required. Secure the location to profit from this years spring and summer tourist season. + 60sq m (internal) plus 59sq m outdoor covered dining area overlooking the Mooloolaba Esplanade and beach (sizes approx) + Existing liquor licence in place + Full fit out available ready for trade + Excellent exposure to Mooloolaba Esplanade Call or email Louisa Blennerhassett to inspect the property or find out about other suitable options. Our team is strategically located in two offices across the Sunshine Coast region and is ready to handle your commercial, industrial and retail property needs today so call or email now. 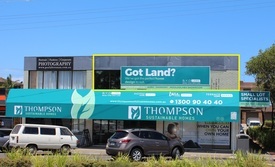 52sqm Retail tenancy Well positioned by Mantra Resort Great Street and Arcade presence Good signage opportunities Plenty of passing trade 3 exclusive car parks High profile location, good foot traffic, excellent exposure. Nestled directly outside the main entrance to the Mantra Resort is this perfect 52sqm tenancy Unique dual aspect appeal onto Venning Street and the main external entrance to the resort AND the main pedestrian entrance in the popular Mantra Arcade. With clever use of signage and window dressing this could be the retail gold mine you've been searching for. 3 exclusive undercover car parks and shared facilities complete the package. Please contact our marketing agents to arrange an inspection. Retail shop for sale and lease on busy Brisbane Road with approximately 6 metre frontage and good exposure to this busy thoroughfare. This property is currently fitted out as a restaurant. Floor area 81m2 Full commercial kitchen Cold room Common tenant car parking at rear and ample customer car parking to street Existing illuminated sign to the street front Air conditioned Shared toilet facilities For lease: $25,000pa + Outgoings + GST For further information or an inspection please contact marketing agents Luca Reynolds 0422 777 074 luca.reynolds@raywhite.com Dave Tyson 0427 146 327 dave.tyson@raywhite.com Approx.